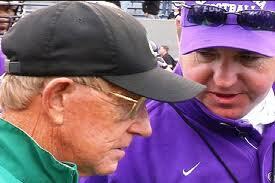 Holtz is also refusing to go to the game because his son, Skip, pictured here with him, coaches South Florida. It is the classic clash between blood and ties that bind for the coach who led the Irish to their last national championship sometime back when buffaloes roamed the prairie. Holt has his own statue near the famed stadium at South Bend, but despite that, he knows blood is thicker than water. "Skip Holtz is the head coach at South Florida. I've known him most of his life," Lou told NewsCenter 16 at WDNU . "A very positive and very good coach." So Holtz will not be cheering on the Blue and Gold to win. "It's the only time I've ever picked against Notre Dame," Lou explained. "It's not an upset. An upset is what his mother would be if I picked against her son." Holtz will be in the ESPN studio feeling sick to the heart that he has to pick between family and fame and friendship. He also gets far more nervous when his son coaches than he ever did when he was in charge. "I could be [coaching] in the biggest game in the world at a critical time and I would never get nervous because I was involved and could help determine the outcome of the game." That isn't the case as the father of Skip, coach. "When you are a spectator as I would be at this game, you get nervous because you have no control over the outcome of the game." "I'm very proud of him and he doesn't need my help," Lou says. "Our entire family will be here to support Skip but I will be at ESPN."